My daughter – who has long been known on the Internet as Lil Miss – started the sixth grade this year. When I was in the sixth grade, way back in the last century, we were the Big Kids of the Elementary School, but now sixth grade is the beginning of middle school. Lil Miss suddenly has a locker and changes classrooms five times a day. I have to admit, getting from room to room on Back to School Night was a challenge for me! She seems to have the hang of it, though. Recently, her English class has started reading Boy of the Painted Cave by Justin Denzel. Tao is an outcast. Unlike the great hunters of his clan, Tao does not want to kill the wild bears or woolly mammoths of the hunt. Instead he wants only to paint them. But only Chosen Ones can be cave painters. What’s more, Volt, the clan leader, violently despises Tao. And when the other clan members discover Tao’s secret talent, they cast him out into the wilderness alone. There, he befriends a wild wolf dog named Ram, and the mysterious Graybeard, who teaches him the true secret of the hunt. The book was first published in 1988 (which happens to be the year I finished sixth grade and moved on to Junior High myself), but I hadn’t heard of it before. I did find a copy of it hanging out on the library shelf, though, so I checked it out to read along with Lil Miss. I don’t remember my parents ever reading something just because I was reading it in school; did your parents do that? If you’re a parent, have you read a book because your child was reading it in school? Or do you plan to, if you haven’t reached that age yet? This post is part of the 2018 Discussion Challenge hosted by Feed Your Fiction Addiction and It Starts at Midnight. My daughter and I are doing a family book club at her school this year, so this will be the first time we read a book together that’s not bedtime related. I’m looking forward to getting her take on what we read together. That sounds really neat! I love the idea of family book clubs. I would totally do this. My kids’ district doesn’t do a lot of whole class novels (which I love about them), but if and when they do, I am on board to read along! I just read Fahrenheit 451 with my daughter, who’s a freshman this year. I loved reading it along with her! 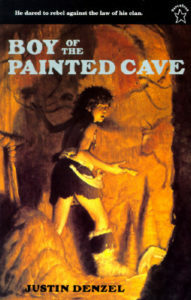 Hope Boy of the Painted Cave is great—I hadn’t heard of it either.